A woman has said she was "experimented on" when she was 11 years old at a Derbyshire hospital. Margaret, not her real name, said she was sent in 1971 to the now-defunct Aston Hall Hospital, in Aston-on-Trent, and "tied and drugged for treatment". When it was raised in Parliament, the prime minister said it was "vital that the full facts are considered". 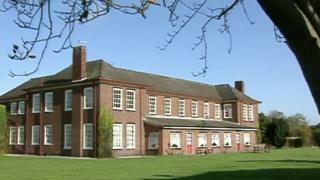 The Derbyshire Safeguarding Children Board said it was investigating the historical allegations of abuse. Complaints had been made against the mental health hospital more than 20 years ago, but it is unclear whether any action was taken. Now several patients, who were treated there as children more than 40 years ago, have come forward to say they were abused. Margaret, who is now 57, said she received "treatment" from the doctor in charge, Dr Kenneth Milner, who died in the mid-1970s. "He just looked at me and he said 'no tea tonight, treatment'," she said. "The nurse got a bandage and tied my hands together. The nurse left, a mask was put over my face and a fluid was dripped and then I went unconscious. "It was the most terrifying thing that any child could go through. "Who could do that? What were they getting out of it? Why? What did I do so bad to deserve that?" Margaret said she managed to secure a copy of her file from the hospital records which remain, but they did not appear to include any details of her treatment. But there was a letter from a relative to hospital managers more than 20 years later that said it had had an impact on her life since. Derby North MP Amanda Solloway raised the issue of the "alleged experiments" at Aston Hall during Prime Minister's Questions. David Cameron said: "She (Amanda Solloway) is absolutely right to raise this matter; they are very serious allegations and it is vital that the full facts are considered".